Today when it comes to buying Bitcoins you usually go to a Bitcoin broker (e.g. Coinbase and Coinmama) or a Bitcoin trading platform (e.g. Bitstamp and Kraken). However some of these exchanges just don’t cut it – either due to their accepted payment methods or their geo restrictions (for example Coinabse doesn’t accept people from many countries around the world). In this case you can always use something that can be best described as “the eBay of buying Bitcoin”. Networks of Bitcoin sellers from around the world that allow almost anyone to buy Bitcoins. Today there are two platforms that supply this kind of service – Paxful and Local Bitcoins. I’ve reviewed Local Bitcoins in the past and today I want to take the opportunity and review Paxful as well. In its core, Paxful is very similar to Local Bitcoins. You choose the amount of Bitcoins you want to buy and your payment method, and then you are presented with available sellers. Each seller has a reputation from past trades and each specifies their Bitcoin exchange rate. The exchange rate is much higher than what you’ll find at regulated trading platforms like Bitstamp and that’s due to the fact that sellers are taking a much bigger risk when selling Bitcoin to strangers. Since Bitcoin transactions are irreversible, if someone pays the seller and then denies he ever conducted the transaction, the seller may end up with no Bitcoins and no payment. 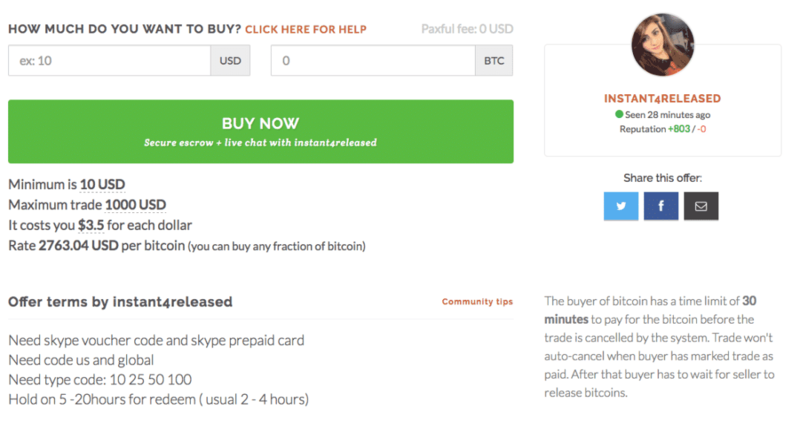 Also, some sellers allow you to buy Bitcoins with less traditional payment methods (e.g. Amazon gift cards, Skype voucher codes), so they tend to charge more for those. Finally the seller will also display any specific details he deems relevant for the transaction. You will be able to see if the seller is currently online as well so you can both chat about the transaction once it’s underway. Then you get the chance to either search through the complete list of sellers or just get shown the best sellers possible based on Paxful’s criteria. Once you choose a vendor and click “trade” You will be redirected to the trade page and you can chat directly with the seller via the live chat. Once they answer you then follow their instructions to pay, click mark as paid and wait for them to release the bitcoins directly to your Paxful wallet. Most trades are instant, but it depends on the payment method and if the seller is online. Paypal and gift cards for example are instant. Bank and CO-OP credit union cash deposits, Western Union, Moneygram take some time as you must leave your home to their branch and deposit cash. Usually they happen in under 1 hour. When a trade starts, seller bitcoins are transferred automatically to Paxful’s secure escrow and at this point the seller can’t cancel the trade. Only a buyer can cancel a trade at any moment and the bitcoins will be transferred from the escrow back to the seller’s wallet. If the buyer hasn’t delivered the payment and didn’t mark payment as complete within the payment window time frame, a trade will be auto-cancelled and the bitcoins will be moved back to seller’s wallet. The supposedly cool thing about Paxful is that it doesn’t take any fees from you as the buyer. The site only takes 1% from the total sale amount from the seller. However saying that there are no transaction fees is a bit naive since most sellers just portray these fees inside their exchange rate. This is very similar to what Local Bitcoins offer. From reading online reviews about Paxful it’s obvious that some people mistake the platform’s integrity for the seller’s integrity. Meaning, if a seller scammed them or was not trustworthy they assume the platform isn’t legit as well. That’s why I wanted to point out some resources that may help you solve any issues when buying Bitcoins through Paxful. There’s an active support forum on Paxful were you can ask any question you like regarding the platform. Make sure that the user that you are trading with is online, orders will auto cancel in a short period of time and if the seller isn’t online that may be annoying. Do not release the payment from escrow unless you have full control over the payment you receive. That means, confirmed, in your account, not pending or anything else. There are many debates online whether Paxful is legit or not. There’s also this site that gives you a breakdown of why (in the author’s opinion) the site isn’t trustworthy. In my personal opinion Paxful is legit (I even ran the Bitcoin scam test on it). However there may be users on Paxful trying to scam you. But this is true for every other P2P marketplace out there like eBay, LocalBitcoins and OpenBazar. Both platforms seem to supply similar services, however LocalBitcoins has more experience and reputation in the field. In the end, it all boils down to the sellers. Whatever platform supplies you a seller that suits your needs (i.e. payment methods, exchange rate, reputation) I would use that platform. Functionality-wise they are pretty much the same, so no clear winner at the moment. Just make sure to exercise caution whenever conducting trades with strangers.